I have just returned from three weeks shooting in Mexico’s Riviera Maya. Quite a surprise since Cancun has never appealed to me. But the towns to the south – Playa del Carmen and Tulum, have quite a relaxed air, and of course they are booming. Very popular with Italians amazingly enough. 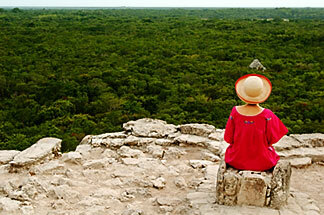 Below is a woman meditating at the Mayan ruins at Coba. More images of the Riviera Maya.